Church Brothers Farms is doubling down on its commitment to being a leader in AgTech with the unveiling of a first-of-its-kind technology clean energy solution this week. 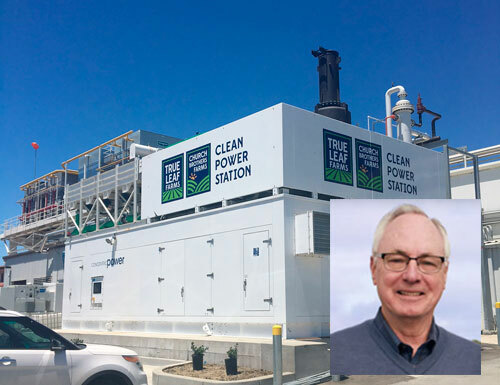 The company debuted its Clean Power Station, a cogeneration system, during the 2017 Forbes AgTech Summit field tour at the True Leaf Farms processing plant in San Juan Bautista, California. Cogeneration, which is also referred to as cogen or Combined Heat and Power (CHP), is when electricity and heat is produced from a single fuel source. Powered by a natural gas fueled engine, a cogeneration system is a highly efficient way of capturing heat that would otherwise be lost during the production of electricity. Church Brothers Farms’ new cogeneration plant also provides an additional step, according to a press release, where the thermal energy (heat) becomes cold with the use of an aqueous ammonia absorption chiller. Due to this extra step, the company explained that the plant will generate 2MW of electric power, which will then be used to run its state-of-the-art processing facility. As an added bonus, the process will recover enough heat to provide 300 tons of low temperature refrigeration. The Clean Power Station at True Leaf Farms was created in partnership with Campbell, California-based Concentric Power, a company adept at creating high-efficiency energy modules for onsite electric power generation and low temperature refrigeration. Tom and Steve Church, Co-Chairmen of Church Brothers Farms, are investors in Concentric Power. When fully operational the cogen system at the True Leaf Farms processing facility will reduce the company’s carbon emissions by 25 percent, the release reports, allowing the company to return power into the grid. A cogen system is also controllable, which will allow True Leaf Farms to control when it is on or off, a luxury not available when using solar or wind power. Concentric Power uses a patented control system, which enables a smart software layer and maximizes technical efficiencies and economic results.